Need airport transportation or airport shuttle service? Whether for business or personal trips, depend on us to transport your group securely and on time! Our airport transportation services cater to budget minded groups like non-profit sports teams or church groups while our executive limo style buses are often requested by business clients. 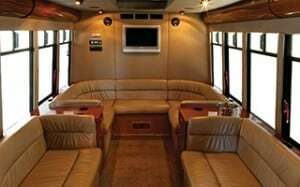 Our luxury coach buses provide audio/video equipment plus air conditioning for added comfort. School buses offer some of the lowest per passenger pricing available. View photos of our upscale executive coach and school bus options here to select your airport ride! • Low Cost, Superior Quality. In both the school bus or limo bus classes, you are sure to realize costs savings compared to airport limousine rentals. Our focus is to provide on-time, secure airport transportation delivered by friendly drivers. Our drivers are fully supported by a dispatch and local management team. • Passenger Load Flexibility. Buses of various sizes can accommodate your group efficiently. If you require many buses we can help, too, as we operate hundreds of buses throughout Ontario. • Safety & Trust. We provide charter bus rentals to private adult groups and school districts alike. Trust an operator that is trusted to transport thousands of children each and every day. We’re passionate about passenger safety! Contact us for a FREE QUOTE for your camp airport transportation needs! Airport Limo & School Bus Service in Your Area! Our buses are available for airport transportation service throughout Southern Ontario, including; Greater Toronto, Mississauga, Brampton, Etobicoke, Markham, North York, Oakville, Burlington, Windsor-Essex County and surrounding areas. School buses are additionally available in Bradford and Simcoe County. For airport transportation services in your area, please submit the online charter request form or call us for quick follow up.